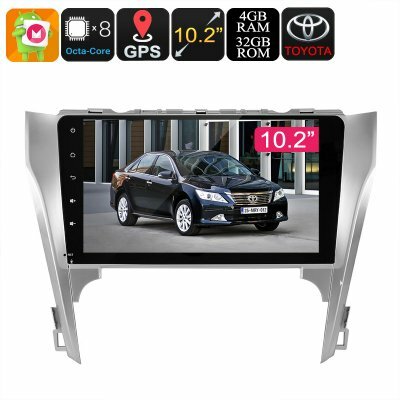 Successfully Added 2 DIN Car Media Player - For Toyota Camry, 10.2- Inch, Bluetooth, WiFi, 3G&4G GPS Navigation, CAN BUS, Google Play to your Shopping Cart. Entertain your passengers throughout the longest of upcoming road trips with this 2 DIN car media player. Designed for the Toyota Camry (Model 2012 – 2014), this Dual-DIN car stereo is sure to bring hours’ worth of fun and entertainment into your vehicle. With its Android 8.0 operating system, it lets your passengers enjoy games, movies, and Apps straight from your dashboard. The car gadget has a large 10.2-Inch display that brings forth crisp HD resolutions. Therefore, your kids or passengers can enjoy their favorite media to its absolute most while driving along in your car. Thanks to its Octa-Core CPU and 4GB RAM, it is capable of tackling all basic software features without dropping a frame. With its WiFi and 3G dongle support (dongle not included), it even lets you browse the web at any time. This means that you’ll be able to download files, stream media, and stay connected to friends and family no matter where you’re at. Additionally, it also supports Bluetooth which enables you to listen to your favorite songs or to engage in hands-free phone calls while driving your car. Besides its entertainment options, this car stereo also features a highly accurate 20-channel GPS. With this car navigation system at your side, you can head out on your next road trip with confidence. Simply insert the Android map of the region you’re headed, and this car GPS will lead you the way. From now on, you can be guaranteed that you’ll never get lost on the way again. No matter for what purpose you use this 2 DIN car stereo, it is sure to increase your driving experience. Arabic: - 2 سيارة ستيريو - Chinese Simplified: - 汽车音响 2 - Czech: - 2. z autorádia - Danish: - 2 bil stereo - Dutch: - 2 van de autoradio - French: - 2 d’autoradio - German: - 2 Auto-Stereoanlage - Hebrew: - 2 סטריאו לרכב - Hindi: - कार स्टीरियो के 2 - Italian: - 2 di stereotipia dell'automobile - Japanese: - 車のステレオの 2 - Korean: - 자동차 스테레오의 2 - Malay: - 2 Stereo Kereta - Norwegian Bokmål: - 2 av bilstereo - Romanian: - 2 DIN Car Stereo - Russian: - 2 стерео - Spanish: - 2 del estéreo de automóvil - Thai: - 2 ของเครื่องเสียงรถยนต์ - Turkish: - 2. araç müzik seti - Vietnamese: - 2 xe hơi âm thanh Stereo.